A little while back, I conducted an interview with the creator of StarDrive shortly after the Kickstarter campaign concluded successfully…hell, WILDLY successfully. I admit now, I should’ve read that interview again before playing the game for this preview, because in there were small little tidbits on how to play the game that honestly aren’t ANYWHERE else…not in a manual, not in a help file, nooooothing. Did this handicap of knowledge prevent me from enjoying this ambitious game, even in its current alpha state? Read on to find out. StarDrive is a big game. 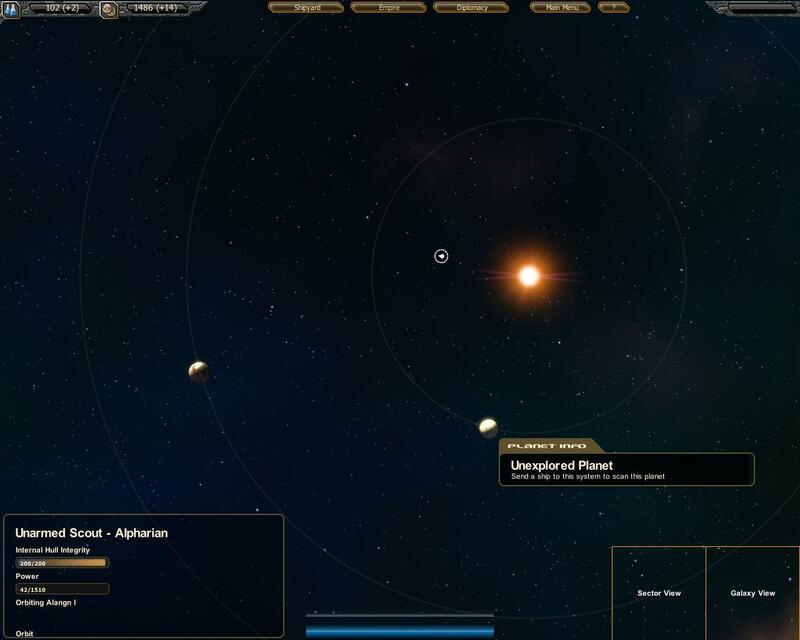 First, you have access to a fully real-time 4X strategy game which strives to capture the “magic” of Master of Orion 2, as well as an adventure mode similar to Escape Velocity. The heart of both of these is your ship. In campaign (4X) mode, you start with your race’s flagship, while in adventure mode, you start with a small shuttle. 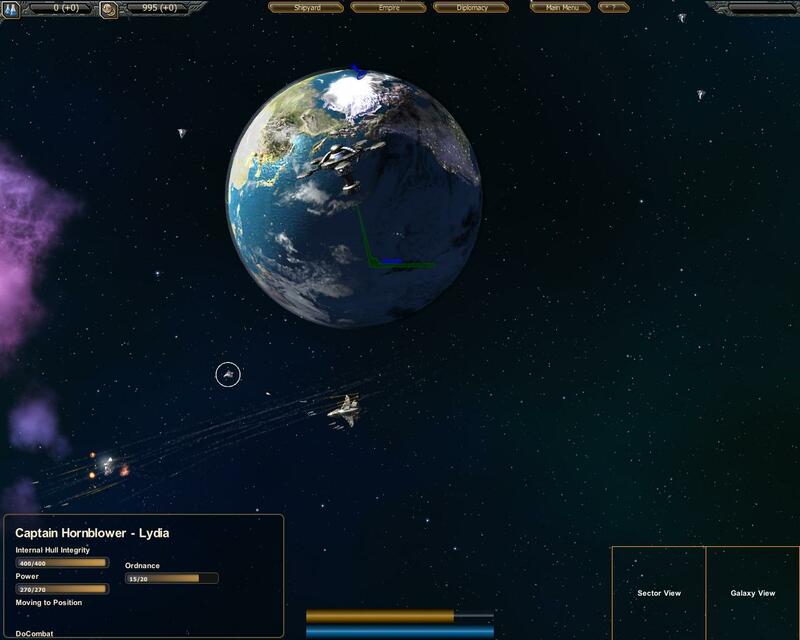 You control your ship with the WASD keys or by selecting points on a map to move. StarDrive has a very straightforward shipbuilding interface with which you simply add components like pieces on a Lego board. Different pieces go into different slots (internal, external, etc) so you can make nearly any combination of ship you wish, as long as you have the space for it. In the campaign game, it really does feel like a real-time version of Master of Orion, which is a good thing. Your ships are built and fly around in real time, which keeps things moving, but not overwhelming, as the pacing feels right. Before you even enter the campaign, however, you have to choose your race and your starting attributes. 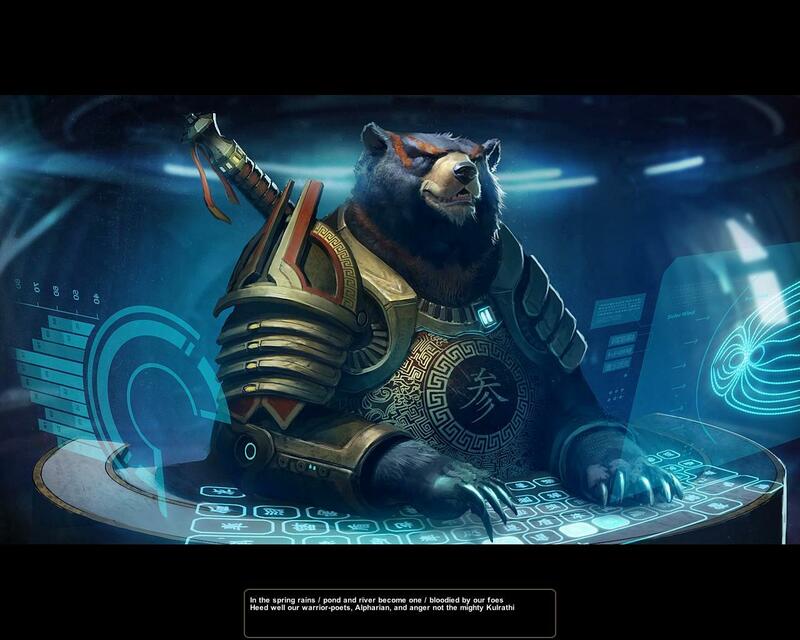 The alpha currently includes four races, and each of them can choose between several attributes in three categories; Physical, Sociological and History + Tradition. These give a lot of variety as to how your game might play out, as playing as a smart yet gluttonous race will likely play different as a race with a high naval tradition. 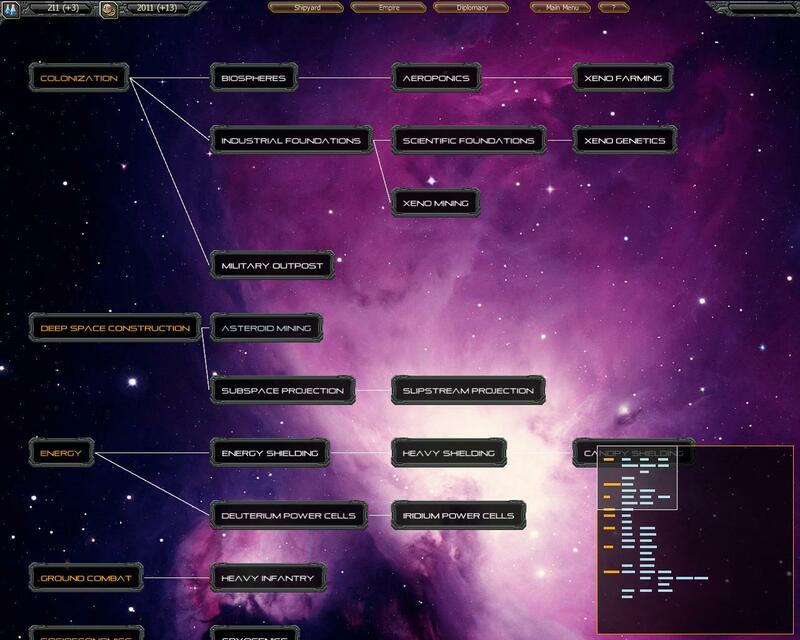 For my first game, I chose the Alpharians (humans, basically), and chose the attributes Prototype Flagship and Smart. This gave me an advanced ship — with which you personally command, and with which you can control a fleet of your own — and more research points. Research, speaking of which, is unlike many other 4X games. 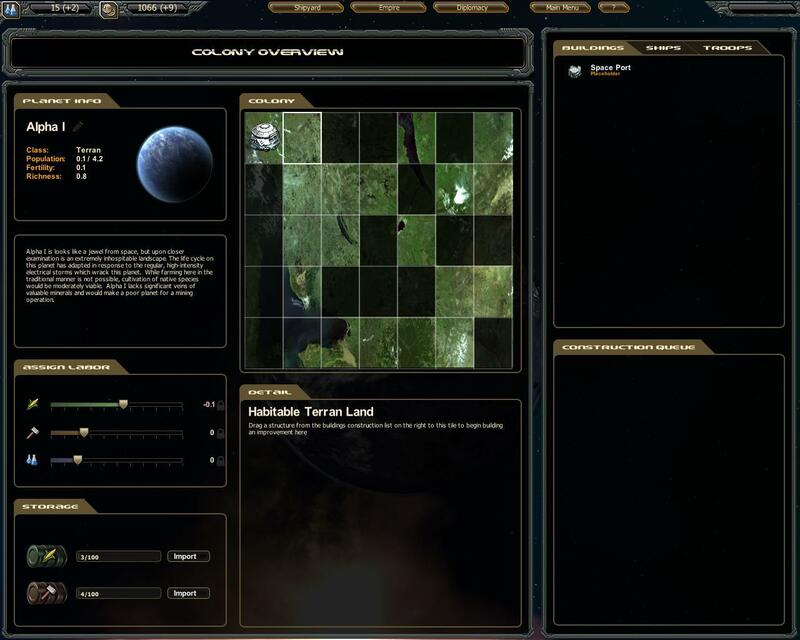 In most games, you choose a topic to research and await that research to be completed. In StarDrive, your society builds a certain amount of research points as time goes on, and you use these points to purchase breakthroughs such as shields, armor, weapons and so on. This was weird at first, but in the end felt really streamlined. Controlling your empire, at least in my games, was more complicated than it needed to be in some respects. The Q&A mentioned allowing scouts to auto explore, but I had no idea how to make them do that, so I had to command each scout manually. This not only means telling a scout to go to a system and explore it, but each planet must also be scanned in order to see it, and since I didn’t know the keyboard commands, I had no idea how to tell them to do this, so I had to do it all manually. It was a bit annoying, but honestly, I like that the option is there in case someone WANTS all that manual control. On the opposite side of the coin, if you have colony ships about, they’ll move to a newly found planet suitable for colonization on their own, which was handy. Eventually, my first campaign game crashed — it IS an alpha after all — so upon restart, I decided to try adventure mode. 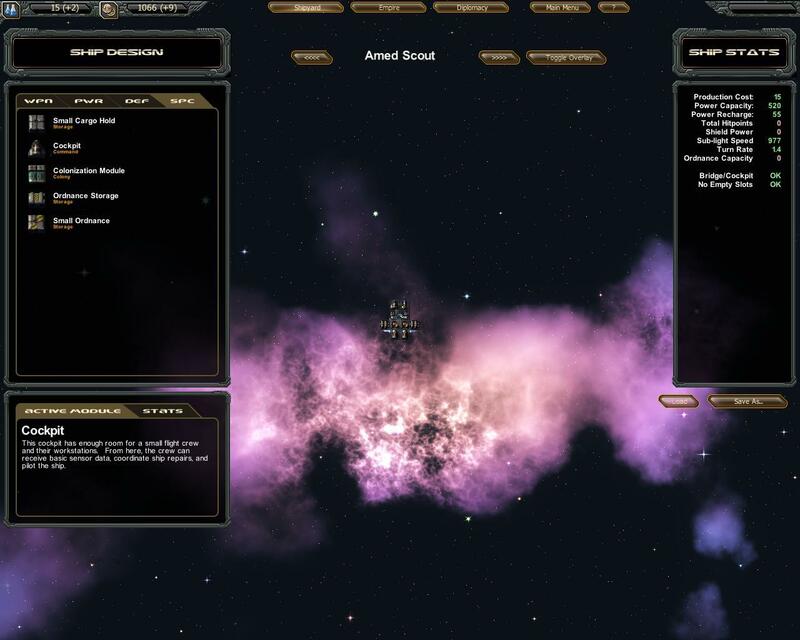 In adventure mode, you can name your ship and captain, and also choose some starting attributes. For my first game, I chose Captain Hornblower and his ship, Lydia (original I know, but “Beat to Quarters” is my favorite book in that series). I found myself in the SOL system, so I headed for Earth, thinking I could dock there and maybe find some cargo to trade or a mission to run. I got to Earth after making several hops along the way. Warp drives use energy, and in this case in my little ship, it runs out fast, so I warp, recharge, warp, recharge, etc. Once I got to Earth, I tried to figure out how to do with a station, and after a moment or two, I was just attacked by a nearby ship! WHY?? I Haven’t Done Anything! Looking past the gameplay for a moment, the presentation of the game is about what you’d expect for an indie title. The graphics are VERY vibrant and reminiscient of Escape Velocity, in a good way. This means very clean, crisp and easily identifiable ships, stations, planets and so on. The sound is also very good, with excellent music and sound effects that are quite well-done. Overall, regardless of my not really knowing what I was doing, and dying a lot, I honestly had a FABULOUS time playing StarDrive. Seriously, the game has a ton of potential, and even though my games never went well, I had fun playing them regardless. StarDrive is completely ambitious and full of adventure, and I can’t wait when this game is fully ready for release, as I have a feeling I’ll lose many hours to it. Thanks for reading, and please enjoy my gallery below. I apologize for the low number of screenshots, but my screen capture program was having issues with StarDrive for some reason. Yeah, I totally need to play it more. How did you figure out the controls? When will StarDrive be released or at the very least be open for Beta? Welcome to the blog Jay. And ugh, I should’ve mentioned in the article, but you can snag a copy on Desura. You can’t grab a copy on Desura any more! We’re publishing with Iceberg Interactive in Q4 of this year. Oh noes! I knew about the publishing deal of course, but not about Desura! Sads! I would really like to see a pre-order of this become available again. I was disappointed to see it is no longer available on Desura. The game looks very interesting, and I’m afraid I will forget about it if I don’t already own it by the time it comes out!